As a supplement to my presentation to U.S. history teachers on classical music, I have embedded three pieces of music by American composers that are ubiquitous in concert halls around the world. For those not attending my presentations, I simply ask that you take time to enjoy the music. By any measure, these are three masterworks. Aaron Copland finished composing his ballet suite about Billy the Kid in 1938. The music portrayed the Kid in a sympathetic light, and I suspect that had Copland composed it a dozen years earlier, he would have used a different musical style and presented an entirely different version of the Kid's story. I say this, in part, because Copland had reinvented himself as composer during the decade after he left Paris and returned to America in 1924. After he finished his studies at the Fontainebleau School of Music, he came home determined to create music that was “as recognizably American as Mussorgsky and Stravinsky were Russian.” He then embraced modernist dissonance and tone clusters, composing avant-garde music that seemed intentionally designed to provoke audiences. His music may have sounded “American,” but it was music that would never find a wide — or let’s say, “democratic” — audience. 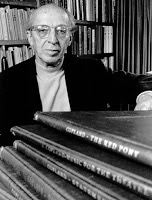 Not until 1936, when he composed El Salon Mexico, did Copland begin to develop the “populist” style for which he is so well known, a style that often incorporates the simplicity of folk songs. The change in Copland’s compositional style came partially from the social and political changes stemming from the Great Depression, as well as the rise of fascism in Europe. He wanted to expand his audience and create music that was accessible and inspirational. He wanted to give Americans a sense of ownership and pride in their nation’s heritage. He wanted to help people feel good about being American. Copland's change in philosophy should lead to an obvious question: If he was so determined to celebrate what was good about America, why did he choose to compose music about an outlaw like Billy the Kid? To answer that question we must begin by understanding that music and art are a product of the time in which they are produced. Copland's version of Billy the Kid, in many ways, was nothing more than a product of its time. At the time Billy the Kid was shot dead by Pat Garrett in 1881 (over fifty years before Copland's ballet), he was portrayed by the media as a black-hearted villain and cold-hearted killer. The Kid represented anarchy and lawlessness and throughout the late 1800s became a symbol for everything wrong with the American West. After he was killed, one newspaper even referred to him as the “devil’s meat." By the early 1900s, the Kid began to disappear from American media and history books, having become a character from the past who Americans wanted to ignore and forget. Then, in 1926, a Chicago journalist named Walter Noble Burns published The Saga of Billy the Kid. Burns had visited New Mexico and heard firsthand accounts of the Kid that changed his view of the boy outlaw. Burns interviewed people who had known the Kid and used those interviews to write a book that was eventually listed as a main selection of the Book of the Month Club. In short, Burns had written a bestseller that resurrected and redefined the Kid in popular culture. In The Saga of Billy the Kid, Burns portrayed the Kid as a young boy fighting against a powerful and corrupt political machine. According to Burns, the Kid was a noble and charming champion of the oppressed. The Kid may have been a violent young man, but his actions were justified, and he personified a type of individualism that was disappearing in America. All told, Burns created a hero for an America that felt betrayed by the financial corruption of the 1920s and economic depression of the 1930s. During the 1930s, the Kid was at the height of his popularity as a hero in popular culture. In 1930, MGM made a movie titled Billy the Kid that showed the young outlaw fighting for the powerless and downtrodden, a heroic character at war with villainous bankers and big landowners. Preview audiences for the film reacted so negatively to the Kid’s death at the end of the film that MGM was forced to create a new ending, showing Pat Garrett shooting at the Kid and intentionally missing. The Kid then fled on horseback across the border into Mexico. As for Aaron Copland’s Billy the Kid, the music did nothing more than conform to the popular image of Billy the Kid that was widespread during the 1930s. Had Copland composed Billy the Kid in 1925 it might have been a dissonant portrayal of a villainous desperado. The version composed in 1938, however, provided a folksy depiction of a young boy who was muy simpático. Today, Copland’s Billy the Kid can be heard as a timeless piece of music, a composition that represents much more than a milestone in Copland’s evolving compositional style. It is also much more than an artifact of the 1930s. Despite the changes that are sure to come in how music is composed or how Billy the Kid is portrayed in popular culture, Copland’s Billy the Kid will remain an emotional and romantic portrait of an American icon. 0:26 Part 1 — The story begins with Sheriff Pat Garrett leading pioneers westward across the open prairie. 3:38 Part 2 — The story shifts to Silver City, NM, a small frontier town where the young wide-eyed and innocent Billy lives with his mother. Toward the end of this section Billy’s mother is killed by a stray bullet during a gunfight (9:44). Billy then kills the man responsible for his mother’s death and goes on the run, living the life of an outlaw. 9:42 Part 3 — The scene shifts to several years in the future. Billy is an outlaw living in the desert, playing cards with his companions at night. The solo trumpet (11:57) portrays the Kid as a lonely character. 13:17 Part 4 — Billy finds himself in a gunfight with a posse charged with arresting him. Billy is captured and taken to jail. 15:11 Part 5 — People celebrate the capture of Billy the Kid. During the celebration, the Kid kills two guards (18:30) and escapes from jail. 17:26 Part 6 — Billy, alone on the prairie, is hunted by Pat Garrett and shot dead. 18:46 Part 7 — The opening theme returns with Sheriff Pat Garrett leading pioneers westward across the open prairie.